A Scottish Borders-based pharmaceutical firm has completed £1.8m equity fundraising to accelerate its product development in gene therapy. Ryboquin, which has its headquarters in Selkirk, gathered support from existing shareholders and new investors. 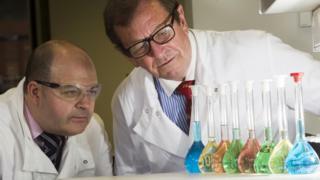 Among those backing the company are Scottish entrepreneurs Brian Kennedy and Sir Brian Souter. Executive chairman Paul Murray said their support was "testimony to the potential" of the firm. Founded in 2013, Ryboquin's business is focussed on gene therapy, primarily in the field of human cancer medicine. In 2016 it announced it had raised £1.3m towards a drug which could make chemotherapy "many times more effective in patients". The latest investment will also see Mr Kennedy join the board of the company. The funds raised will be used to "further scientific development" as well as providing funding for "corporate expansion". Mr Kennedy said: "I am delighted to be part of Ryboquin and to be working with the team that could make great progress in the treatment of cancer and other diseases."